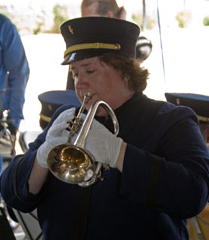 Elisa Koehler playing a cornet solo with Newberry's Victorian Cornet Band at the 2006 Vintage Band Festival. In the tradition of that old Willie Nelson song, I’m getting ready to “go on the road again” to “make music with my friends” in Newberry’s Victorian Cornet Band at the 2010 Vintage Band Festival in Northfield, Minnesota. 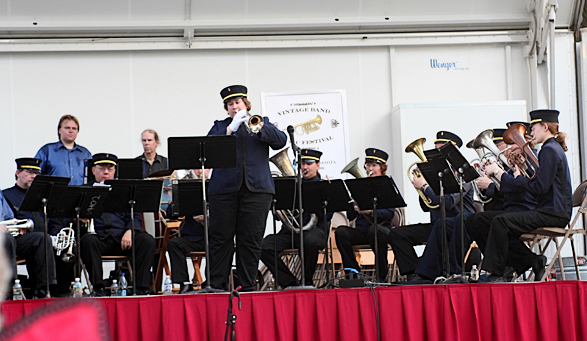 We had a great time at the first Vintage Band Festival in 2006 and we’ll be out there again August 5 – 8 to perform seven concerts. The full schedule is available at the festival website (click on the link above). The Newberry Band is a select group of professional brass musicians who perform on antique instruments from the period known as the Golden Age of Bands (1870 – 1900). We’re a “cornet band” because the instruments we play (with the exception of percussion and occasional trombones) all come from the “saxhorn” family (conical brass). Like the modern British brass band, we use cornets (not trumpets) and alto horns with upright bells (not French horns), tenor horns (also with upright bells), baritone horns, and tubas. One of our tuba players, Antonio, will even be playing an authentic helicon, an ancestor of the Sousaphone. I’ll post some new photos from the festival soon so you can get a better look at the instruments. In the meantime, here’s a photo of the band performing at the 2006 festival at the main stage at Bridge Square (below). The Newberry Band performing at the 2006 Vintage Band Festival at Bridge Square. The music we perform is a lot of fun, too: Verdi opera medleys from Nabucco and Atilla, old time serenades, waltzes, and marches. As the conductor and solo cornetist of the group, I will be performing a wonderful solo discovered by Mike O’Connor, the founder of the Newberry Band: Fantasia on “Safe in the Arms of Jesus” by F. J. Keller. The solo was such a hit with audiences in 2006 that I arranged it for cornet and piano and it was published by the International Trumpet Guild Journal (ITG) as their featured music supplement in June 2009 along with an article I wrote about my experiences with the Newberry Band and my antique cornet (made by William Seefeldt in Philadelphia c. 1890). The music – both the solo cornet part and the piano accompaniment – are available as a free download from the ITG Journal website (click on the link above) along with a brief program note for the piece, but you have to find a print copy of the June 2009 ITG Journal to read my article. 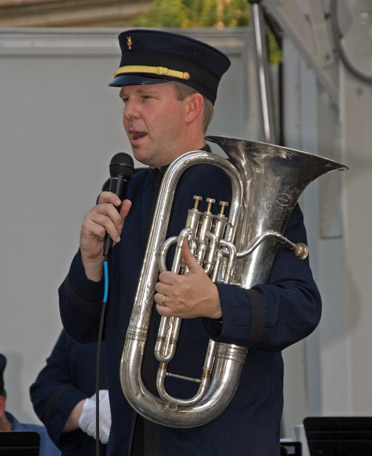 Mike O'Connor with his euphonium entertaining the audience at the 2006 Vintage Band Festival. The Newberry Band was started in 2003 by Michael O’Connor, a musicologist and euphonium soloist who is currently on the faculty at Palm Beach Atlantic University in Florida. In addition to selecting the music the band performs, Mike does all of the research concerning band history and appropriate performance practice. A noted expert on 19th-century bands, Mike is also an entertaining speaker who provides informative notes about the music during the concert program. I’ll try to post some concert videos here during the festival including some of Mike’s commentary because he adds so much to the experience. He should have his own radio show on NPR! People always ask about the band’s name, so I wanted to mention that, too. Before I joined the band, the original conductor and solo cornetist was a fabulous musician named Flora Newberry. Because bands were often named after their leaders in the 19th century, and because “Newberry” is such a great name, the band didn’t change its name when I took over. Finally, there’s one more reason why I enjoy playing with the Newberry Band so much. My maternal great-grandfather, Frank Joseph Kapralek, played E-flat clarinet with John Philip Sousa’s Band at the beginning of the 20th century. When I was writing my dissertation on Italian-American bandleader Salvatore Minichini, Sousa’s biographer, Paul Bierley, very kindly sent me copies of several primary sources documenting Kapralek’s time in the band including ship’s registers from tours with original band member signatures. So now every time I put on my Newberry Band uniform and play my antique cornet, I think of my great-grandfather and enjoy the opportunity to recreate a fascinating era of America’s musical heritage. Frank Joseph Kapralek with his E-flat clarinet in the Sousa Band in 1911.